Tadd has made a couple of media splashes in the past 12 months. About a year ago, he qualified for the US Open tournament, which is arguably the most difficult tournament in the world to qualify for. Then, this past January, he made history as the youngest player in half a century to make the cut at a PGA tour event (professional golf tournament). Here are some quotes from a July 12 AP article. "I'm really ready for this," he said. "It's something that I want to do." "It showed me I can compete with the best players in the world and I can handle myself in front of the cameras. But sometimes I get a little nervous," he said. Finances weren't really a factor in the decision. "I'm not in it for the money at all. I just want to play with the best players in the world," he said. Call me skeptical, but I don't think he was really the one making the final decision on this one. Can a 16 year old really make a decision like this? I mean, there is no going back. It's not like he can bomb out of this tournament or a second tournament and then decide to go back and be an amateur. This following quote from a July 31 AP article sums it up for me. For a high school junior missing his first week of the new school year back home in Honolulu to make a run at a $3 million purse, he offers a remarkably mature take on what's most important in his life. "I think it's more about me. 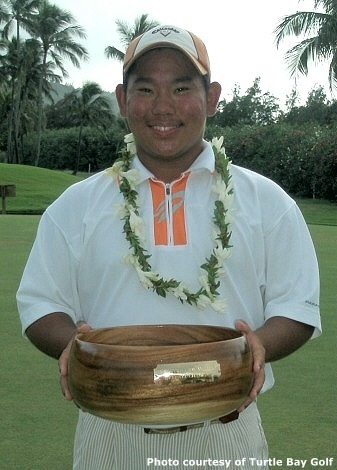 I think that is more important than golf," Fujikawa said. I think this kid (and his parents and his other close advisors) are seeing the potential dollar signs in the short term and not the big picture. I think they're trying to take the "American Idol" shortcut to success, fame, and fortune. I certainly wish the best for this kid, but I don't think it's going to work out as all of them have planned.